Suri, Katie & Tom spotted out & about in Pittsburgh on Saturday, 19th. Suri is wearing her old favs: navy suede shoes by Flora & Henri, faux fur coat by Eliane Et Lena and the kaleidoscope set by Little Ella. Suri, Katie & Tom went ice-skating at the ice rink at PPG Place in Pittsburgh on Saturday, 19th. Happy 5th Wedding Anniversary to Katie & Tom!!! Suri is wearing Kaleidoscope Tank w Lace Trim (first worn on May 17th 2011) and Kaleidoscope Lace Skirt, both by Little Ella Moss (first worn on July 1st 2011). 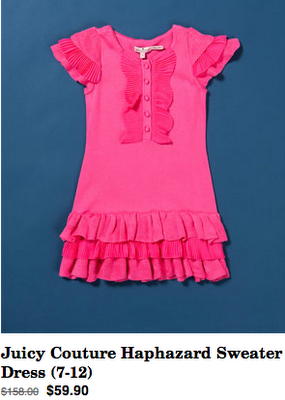 outfit info: Suri also added a light pink long-sleeve shrug and bright pink leggings. 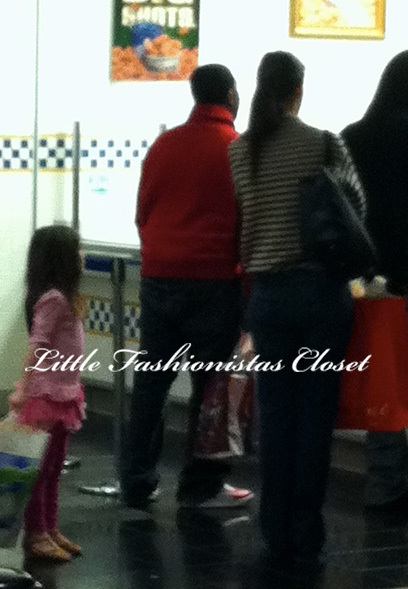 Thanks to Dear Reader Eve for sending her pictures of Suri & Katie shopping at Park Ross Mall in Pittsburgh on Sunday, 13th. Suri is wearing Pink Stripe Dress by Circo for Target paired with pink leggings and dance shoes. Katie talks about their Thanksgiving plans! The actress, wife to Tom Cruise and mom to Suri Cruise, said she does have a meal ready too, but she’s not usually behind the preparation. “I make sure the fixings are there I just don’t tell how they got there,” Katie explained. There is one thing, however, Katie does make – pumpkin bars. “My mom started a tradition where she makes these amazing pumpkin bars — almost like a pumpkin cake with cream cheese frosting, but it’s not too spicy. In my family we travel so much and we’re constantly living in hotels, so my daughter and I have been in the living room of the hotel with powdered sugar going everywhere making this to keep up the tradition,” the “Jack and Jill” actress said. The "Jack & Jill" star tells Martha Stewart in an episode of "The Martha Stewart Show" airing Tuesday, November 15th. later in the evening S&K left their NYC apartment with a bunch of toys.. Thursday, 10th. ..and returned with a big cookie! LOVE Suri's expression!!!! 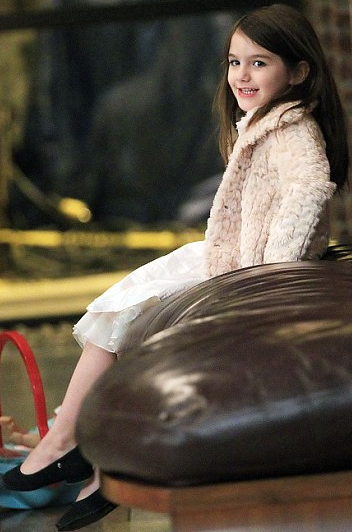 Suri accompanied Katie to the David Letterman Show in NYC on Thursday, 10th. after the interview S&K once again visited the American Girl store. 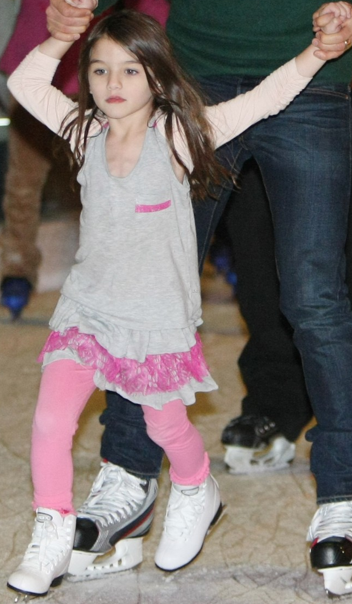 Suri & Katie once again visited Chelsea Piers in NYC on Wednesday, 10th. Suri continued to wear her "trash" shoes; the outfit also included Silk Print most likely designed by Katie (or H&Y kids) and her fav Pink Faux Fur Jacket FW'10 by H&M. Suri was holding Julie Doll by American Girl, purchased yesterday on a shopping trip to the AG store. Suri & Katie went shopping to American Girl store in NYC on Tuesday, 8th. Suri's TRASH outfit - the dress has numerous cuts & tears, the hem looks shortened with the scissors.. the right shoe has a hole on the toe. outfit: h&m faux fur jacket. Suri & Katie spotted leaving gymnastics class at Chelsea Piers on Monday, 7th. h&m pink faux fur jacket, flora & henri green shoes. 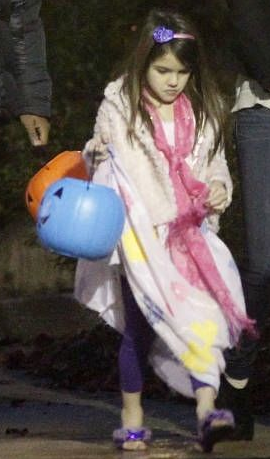 Tom was spotted taking Suri trick-or-treating in the Squirrel Hill neighborhood on Halloween. Katie and Tom visited the Milk Shake Factory on the South Side, home of Edward Marc Chocolatier. Daughter Suri liked the chocolate turtles, or terrapins. They liked it so much, Katie brought Suri back for a return visit. Family is staying at the Downtown Hotel in Pittsburgh. Suri, Katie & Conor went trick-&-treating in the rain on Halloween, Monday, 31st. 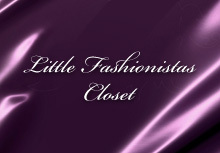 outfit info: faux fur coat, disney purple slippers. Suri & Katie went on a last-minute Halloween shopping trip to the costume store & Target in Pittsburgh on Sunday, 30.
outfit info: armani junior coat, flora & henri shoes, splendid littles dress. Suri & Katie shivered on the set of Tom's new film "One Shot" in Pittsburgh on Saturday, 29th. outfit info: emu ladybug boots, cach cach faux fur jacket.